A Mixed box of 12 Natures Menu 400g raw blocks of mince meat, to be used as part of a complete raw diet. Great value my dog has loved this food from a very young puppy. Perfect mixture of variety and quality. These are great as a supplement, but not a full meal - you'll need to add veggies/carbs and fats to it. I've been getting these for a while now and starting to notice some of them have a lot of water, so the weight of the actual meat content seem to go dow a little. 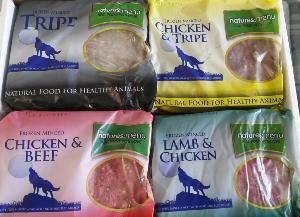 Just good quality raw meat our dog loves them! My dog loves it and always looks so lovely and healthy and it is good to be able to buy the assorted flavours. Gives a good variety of most meats .my dog loves them all.